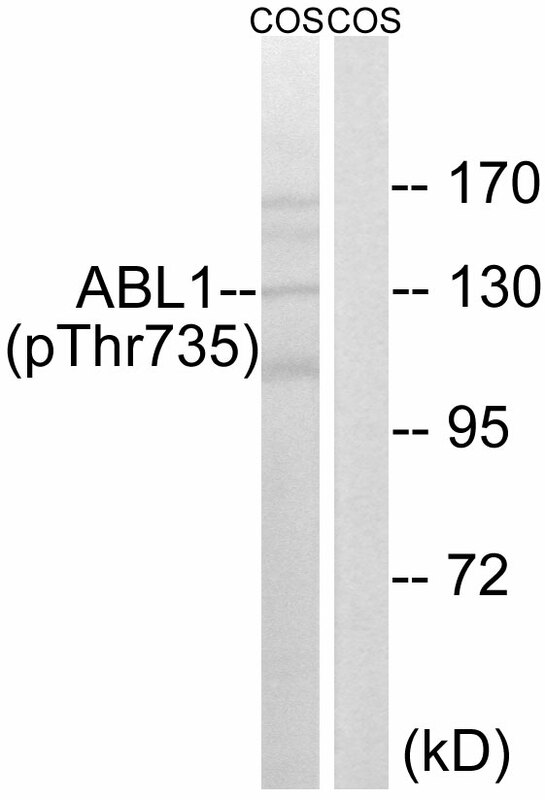 ABL1 (Phospho-Thr735) antibody detects endogenous levels of ABL1 only when phosphorylated at threonine 735. The antiserum was produced against synthesized phosphopeptide derived from human ABL1 around the phosphorylation site of threonine 735 (S-V-TP-L-P). Western blot analysis of extracts from COS cells, treated with EGF (200ng/ml, 30mins), using ABL1 (Phospho-Thr735) antibody. Fainstein E., Oncogene 4:1477-1481(1989). Shtivelman E., Cell 47:277-284(1986). Chissoe S.L., Genomics 27:67-82(1995).